I love baking, especially cakes…and cupcakes are one of the simple pleasures in life whether you’re baking them or eating them. 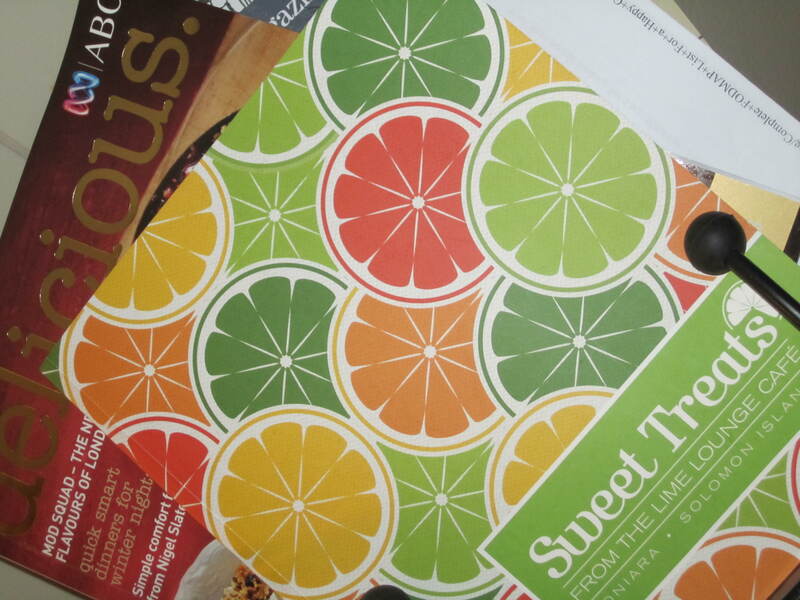 This weekend I decided to try something different, something from a cookbook which was a gift from my sister, and a souvenir from her recent stay in Honiara, “Sweet Treats from the Lime Lounge Cafe”. I went to the “cupcake” section because somehow they always seem just that little bit easier than other things, and once again it was late in the day, I was tired and I didn’t have all that much in the way of ingredients… I chose the upside down pineapple cupcakes despite the fact that I didn’t have any pineapple, deciding on the spot to replace it with apple and coconut. 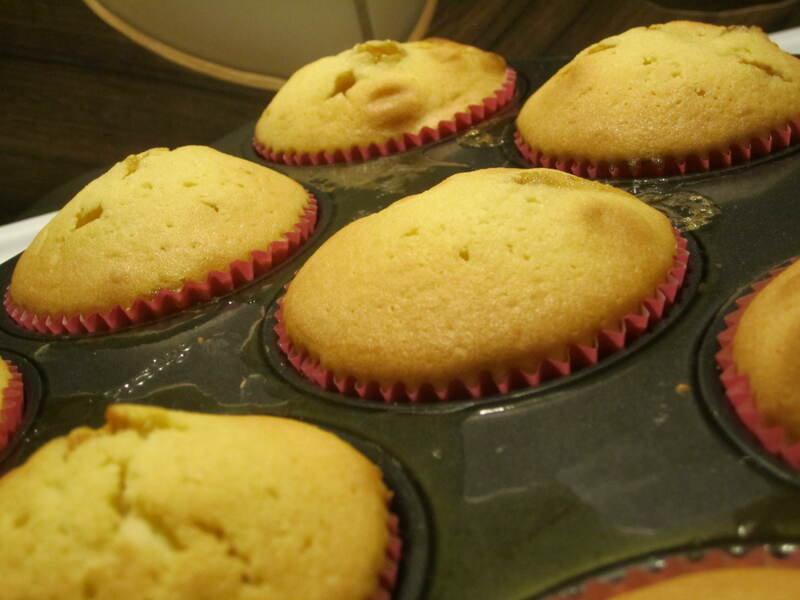 Preheat the oven to 175 Celsius and line a muffin tray with paper cases or baking paper. Combine all the ingredients for the topping and spread evenly amongst the muffin cases. To make the cake batter, place all ingredients in a large bowl and beat for 2-3 minutes until smooth and pale. Spoon the batter into the muffin pans over the topping. Bake for 25 minutes or until lightly golden, then leave to cool completely as this will allow the topping to set. I did all of the above EXCEPT that I used finely diced apple mixed with shredded coconut, in place of the pineapple. I think that pineapple would have provided extra stickiness and held together a bit better, the apple pieces tended to separate a tiny bit, but I cooled them in the fridge before turning them out and they were just fine, and tasted amazing, like tiny little apple tea cakes…the coconut was my nod to the tropical heritage of the recipe! In hindsight I would use less butter in the topping and more sugar, and I might even take the time to caramelise the sugar before mixing it through the fruit. The sugar and liquid from the apples had bubbled up through the top of the cakes, giving them a nice rustic looking finish on top, if you wanted to serve them right way up. 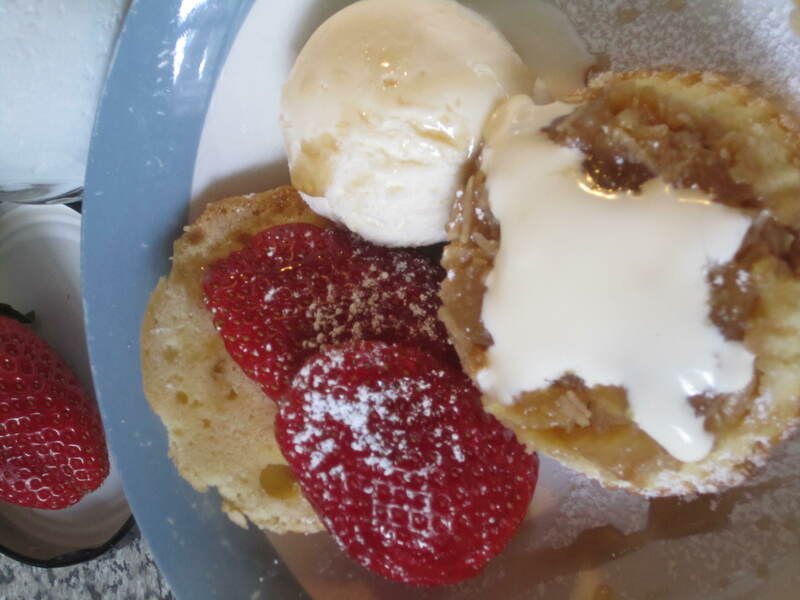 I turned mine up the other way, pudding style, warmed them for a few seconds in the microwave, and served them with vanilla ice cream, fresh strawberries, a drizzle of cream and maple syrup and a sprinkle of icing sugar, like so…I didn’t get any complaints! And because I used smaller pans than muffin pans, I had some left over cake batter which I used to make a few plain jane old cupcakes. These never go astray at my place, and there’s nothing worse than an empty cake dome on the sideboard. 06 Aug	This entry was published on August 6, 2012 at 11:42 am and is filed under Food, Things I Love. Bookmark the permalink. Follow any comments here with the RSS feed for this post. I love the sound of that recipe, you’ve inspired me to give it a try even though I’m not much of a baker. 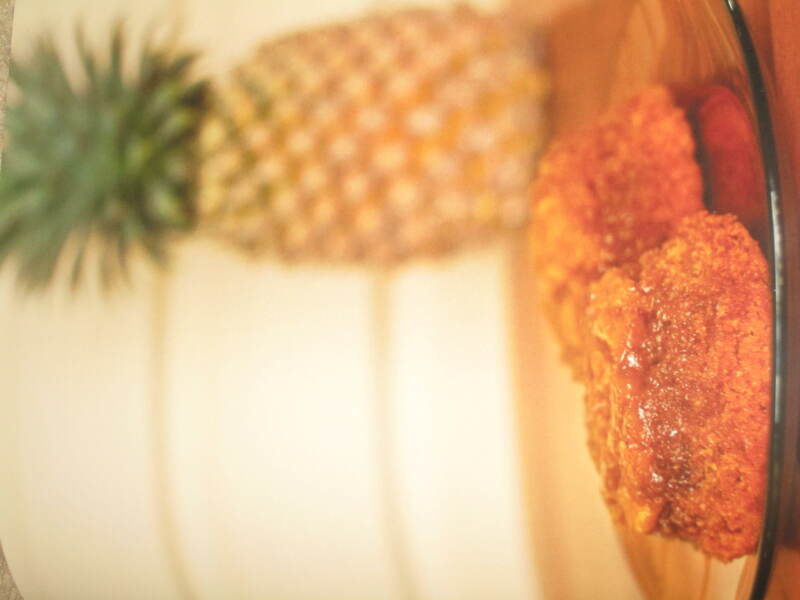 Upside down pineapple cake reminds me of my childhood, it was all the rage in the 70’s on the pacific island I grew up on! If I ever see it on a menu (which is almost never) I always order it. You’re such a talent the way you decide to swap pineapple for apple,this for that and it all works out beautifully! 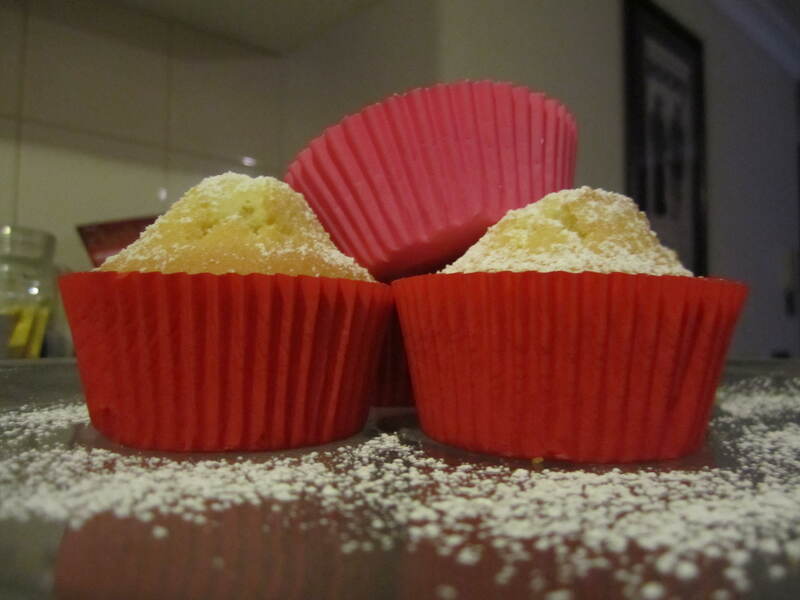 Absolutely love the look of the upside down cup cakes and know how fabulous you are as an innovative cook. Keep going with your blog and all you have to give to so many. You’re such a talent the way you decide to swap pineapple for apple,this for that and it all works out beautifully!!!! !